A new island off Japan's coast offers scientists a “natural laboratory” to observe how animal and plant life begin to inhabit virgin land. Researchers say the key ingredients will be bird poo and vomit, which will contribute to nutrient-rich soil. 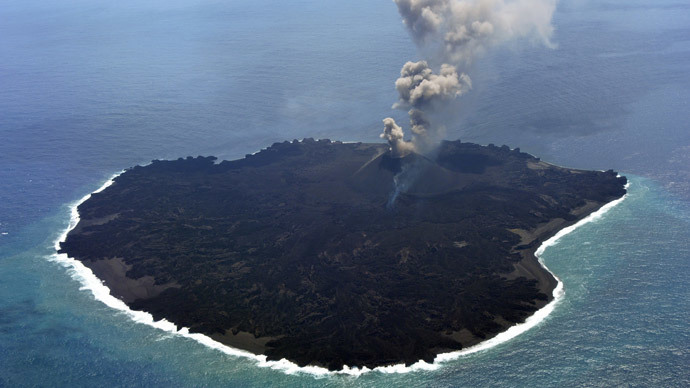 The island, which contains a still-active volcano, is some 1,000 kilometers (620 miles) south of Tokyo. Spanning 2.46 kilometers (620 miles), it emerged from the Pacific Ocean following an eruption in November 2013. It has grown to engulf its once larger neighbor, Nishinoshima, part of Japan's Ogasawara island chain which is known for the variety and wealth of its ecosystem. Though it is currently almost all bare rock formed by cooled lava, scientists say the new Nishinoshima will one day be full of plant – and possibly animal – life. "We biologists are very much focusing on the new island because we'll be able to observe the starting point of evolutionary processes," Naoki Kachi, professor and leader of Tokyo Metropolitan University's Ogasawara Research Committee, told AFP. Those birds could eventually set up home on the island, or at the very least use it as a temporary resting place. Waste from those birds – including feces, dropped feathers, regurgitated food, and rotting corpses – will be the most important component of the island's colonization, forming a nutrient-rich soil offering fertile ground for seeds carried by the wind, or brought in the digestive systems of overflying birds. "I am most interested in the effects of birds on the plants' ecosystem – how their bodily wastes-turned-organic fertilizers enrich the vegetation and how their activities disturb it," Kachi said. Nishinoshima is expected to follow the path of Surtsey, an island that emerged around 30 kilometers (18.6 miles) off the coast of Iceland in 1963. During its half-a-century existence, researchers have watched a habitat evolve on the island. By 2004, it possessed a range of plants, along with 89 species of birds and 335 species of invertebrates. However, Nishinoshima may have a more difficult time, as it is a long way from mainland Japan and not too close to its neighbors in the Ogasawara island chain. This limits the number of species and birds that will arrive on the island. But regardless of its future, Kachi says the island needs to be treated with respect. "I'd like to call on anyone who lands on the island to pay special attention to keeping it the way it is and not to take external species there,” he said.